A major new BBC television series, presented by the maritime historian and archaeologist, Dr Sam Willis, sets out to tell "the stories of the invasions of the British Isles" from earliest times down to the modern era. Appropriately enough, Willis begins by insisting that "invasions come in many forms:" glaciers and pigs, as well as marauding foreign warriors, such as the Saxons and Vikings, can be "invaders." 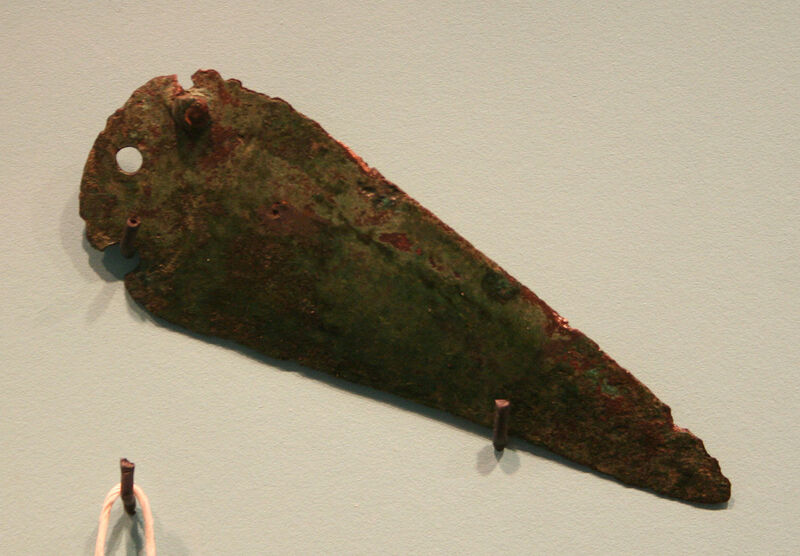 The supposed "Celtic invasions" of the Iron Age, he tells us, probably did not happen in the conventional sense (they may, instead, have been "fashion invasions"): and there may even have been a "foodie invasion," between Julius Caesar's brief military intervention of 55/54 BC, and the more definitive Roman invasion of Britain under the Emperor Claudius in 43 AD; in which Britons were "softened up" by the Romans, through imports of wine, olives, and fish sauce from the Mediterranean. There is little, here, with which I would necessarily disagree. This narrative, however, is somewhat undermined by the production team's insistence on interspersing the comments of Willis and various specialist contributors with CGI-enhanced "reconstructions," showing hordes of hairy warriors charging across fields, variously waving (depending on the period in question) spears, shields, battle-axes, clubs, swords, bows and arrows. Even in Willis's script, there is much talk of the "wholesale replacement ... through violence" of one population by another, and almost no mention of (for example) trade, or intermarriage; as if the replacement of one population by another could ever have been achieved by male warriors in the absence of women - none of whom appear in the reconstructions until the actress, Gina McKee, appears in the character of Boudica from the recent production at Shakespeare's Globe (which production I very much enjoyed, but as drama, not history). The programme sets out, in Willis's words, to bridge "the gap between myth and reality" (the myth being that of British exceptionalism), yet in some respects reinforces a national myth of the British as not merely an "Island Race" (Winston Churchill), but as an unusually martial one. The "wholesale replacement" of one population by another is something that has probably happened very rarely in human history. The European colonisation of some corners of the New World between the Fifteenth and the Eighteenth Centuries may have come close, but this was largely down to the deadly pathogens (smallpox prominent amongst them) which Europeans inadvertently carried with them, to which the native populations had no immunity. Prehistoric Britain and its continental neighbours however, had contact with one another over dozens, if not hundreds, of generations prior to the postulated "invasions," making this scenario far more difficult to believe. The prime example of "wholesale replacement" in the first episode of Invasion! 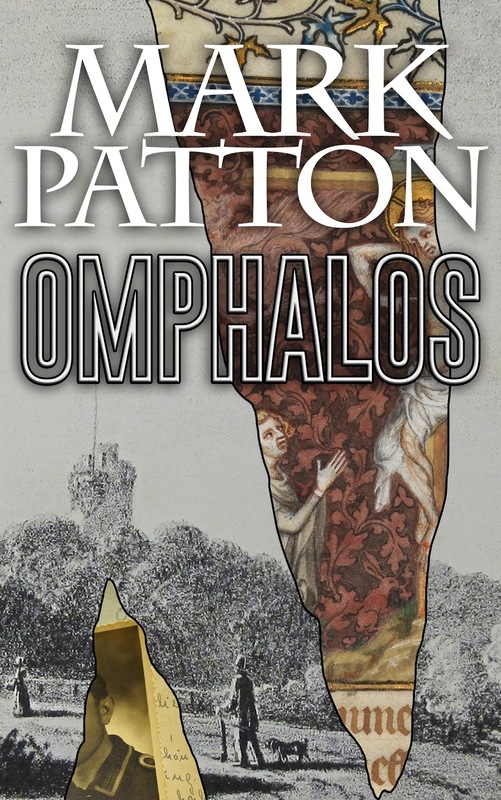 (I ought to clarify that I am writing this having seen only the first episode) is that of the "Beaker People:" these are the people referred to as "Semona" (an entirely fictional name) in my novel, "Undreamed Shores". In the archaeological record for the period 2900-2500 BC, a new package of material culture appears across disparate areas of Europe. This package includes a distinctive form of drinking vessel, the "bell-beaker," together with some of the first tools of copper and bronze, and gold jewellery, and is associated with changes in burial rite, ritual practice, and settlement. 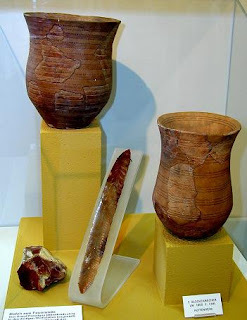 Artefacts of the "Beaker Culture" from Germany. Photo: Thomas Ihle (licensed under GNU). Copper dagger of the "Beaker Culture" from Brandenberg, Museum of Prehistory and Early History, Berlin. Photo: Einsamer Schutze (licensed under GNU). 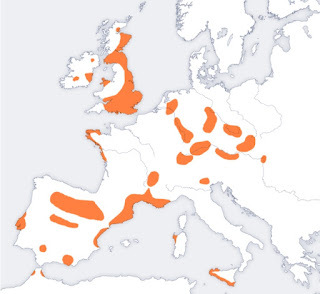 The distribution of elements of the "Beaker Culture" in Europe, based on research by Professor Richard Harrison (image is in the Public Domain). In my earliest academic publications, written between twenty and thirty years ago, I argued (though I was by no means the first to do so) against the idea that this complex necessarily reflected a mass migration of people: my model, in fact, was rather closer to Sam Willis's idea of a "fashion invasion," although this was not a term that I used. 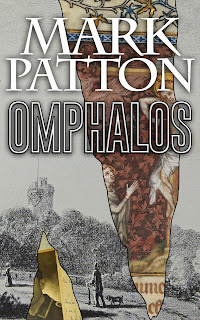 By the time I came to write Undreamed Shores (2012), the discovery of graves such as that of the "Amesbury Archer" (on whom I based the character of Arthmael) had led me to revise this opinion, at least to some extent: the "archer" was, demonstrably, an immigrant to the British Isles, and not from the near continent, but from central Europe (the evidence for this, incidentally, is isotopic, not genetic - it is based on analysis of the water that he drank as an infant, a mineral record of which is preserved in his teeth). Accordingly, I depicted Arthmael as a foreigner, but not an "invader:" nothing in the archaeological record for southern England suggested to me then, or suggests to me now, a large-scale military invasion (which is not to deny that violence sometimes broke out, as it does in the novel), still less a "wholesale replacement" of one population by another. Reconstruction of the burial of the "Amesbury Archer," Salisbury Museum: "Beaker" burials tend to be individual, whereas earlier Neolithic burials are often collective. Photo: Richard Avery (licensed under CCA). 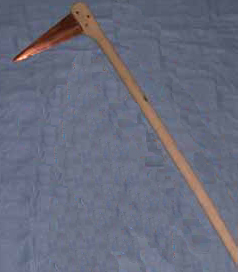 Replica of a copper halberd found with an oak handle at Carn, County Mayo: weaponry does feature in "Beaker Culture" assemblages, and some skeletons show evidence of violent trauma; the rejection of a "wholesale replacement" hypothesis does not depend on an assumption that relationships were always peaceable. Photo: Thefuguestate (image is in the Public Domain). 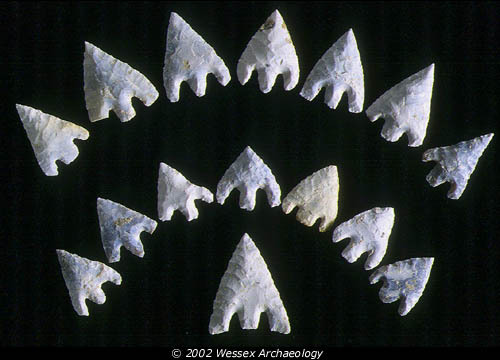 Barbed and tanged arrowheads from the burial of the "Amesbury Archer:" these are likely to have been weapons of war, rather than hunting equipment. Photo: Wessex Archaeology (reproduced with permission). Bell-beakers and associated artefacts are only ever found in a minority of burials in the British Isles, and only in some parts of the country. The burial of the "Amesbury Archer," in many ways a classic "Beaker" burial, was found close to the extensive settlement of Durrington Walls, which was certainly occupied during his lifetime, and where he himself may very well have lived: but where most households continued to use the older Neolithic style of pottery ("Grooved Ware"), and where few objects of copper or gold were found. 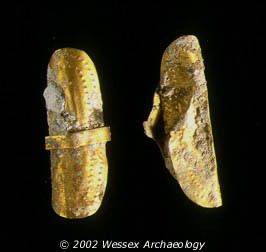 Gold ornaments found in the grave of the "Amesbury Archer:" previously described as "ear-rings," such objects may, rather, have been worn in the hair; some of the earliest gold and copper objects in the British Isles have been found with "Beaker" burials. Photo: Wessex Archaeology (reproduced with permission). When, in the first episode of Invasion!, I heard the suggestion that the "Beaker People" originated in the steppes of the Ukraine and southern Russia (where "bell-beakers" have never been found), I rather assumed that someone on the production team had been reading a text-book of the 1940s or 1950s, when such interpretations were in vogue (before the widespread adoption of radiocarbon dating in its modern form). The "Kurgan Hypothesis" for the spread of Indo-European languages, wheeled vehicles, and the horse. The hypothesis was popularised by the Lithuanian/American archaeologist, Marija Gimbutas, in the 1940s and 50s. "Kurgans" are burial mounds in the Pontic Steppe, superficially similar to the "Beaker Culture" burials found further to the north and west. Image: Dbachmann (licensed under GNU). Out-of-date textbooks pose an occupational hazard for programme makers and historical novelists alike, but so do untested summaries of very recent research. Someone on the production team must surely have read an article in "Nature" Magazine, by Ewen Calloway, dated 17th May 2017, and summarising DNA research by a team led by Inigo Olalde and David Reich of the Harvard Medical School. 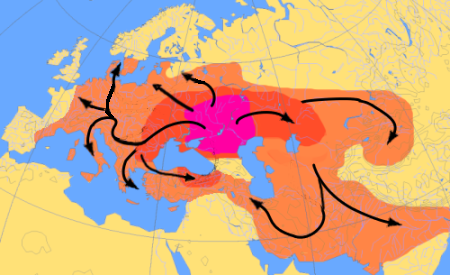 This research does appear to resurrect Marija Gimbutas's "Kurgan Hypothesis," and to suggest the replacement of earlier British (but not continental) genomes by the "Beaker People." Calloway's article, however, carries a fundamental health warning, to the effect that the research has not yet been through the standard scientific process of peer review. The findings seem to be based on an analysis of just nineteen British "Beaker" skeletons, and thirty-five earlier ones, which, it strikes me, is a very flimsy basis on which to build a hypothesis at variance with the available archaeological evidence. As my colleague, Marc Vander Linden, of the Institute of Archaeology at UCL, has commented, this is "not at all the end of the story." So...not a program you recommend, then? Actually, Sue, there's much that's good about it, but I do think that this specific claim is dodgy, on many different levels (many of them unintended, I'm sure), and, since it's a subject about which I've written, both academically and as a novelist, I felt that it required a response. Huw Edwards's version, in "The Story of Wales," comes far closer to my understanding of the archaeological evidence.